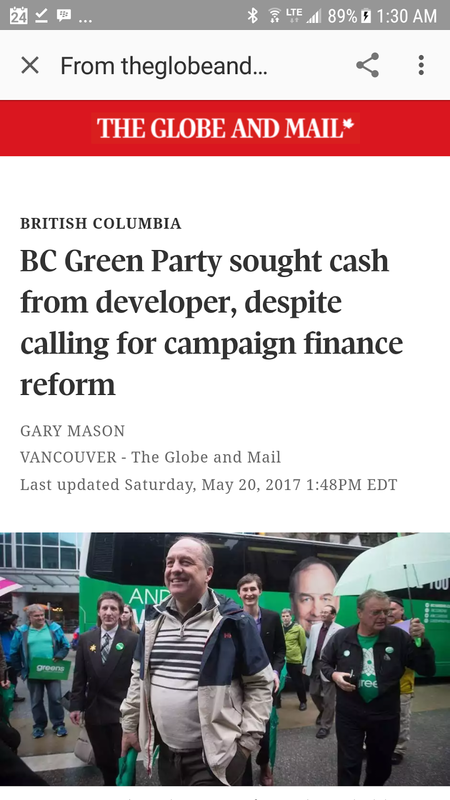 A lot of noise has come from the periphery of the BC political activist community regarding political donations. While everyone is (finally) in agreement that corporate and union donations ought to be banned, another thorny question has come up over fundraising dinners, etc. 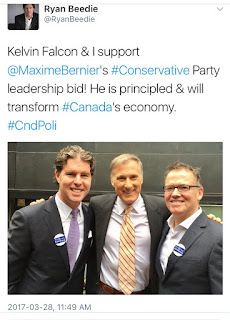 The BC Liberals were famous for their big ticket, intimate dining experiences with high ranking BC Liberal politicians. Some were $5,000 per ticket, some $10k or $20k each. 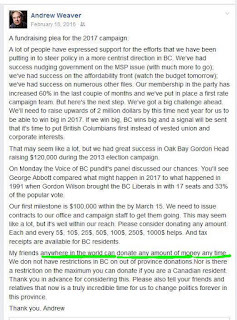 To be sure, the BC NDP has held a handful of their own $5k per ticket events, but most of them are a fraction of the cost of the BC Liberals model. But the question is, are fundraising dinners even ok? Certainly they're legal in the current framework, but given the tone right now, should that change? What did the parties campaign on? In an earlier blog post, I invented a scenario where I hosted a backyard BBQ fundraiser for [party] and charged $75 a person. Food cost for a burger and salad might hit $5 each, and my labour would be volunteer. Does that make me the bad guy? 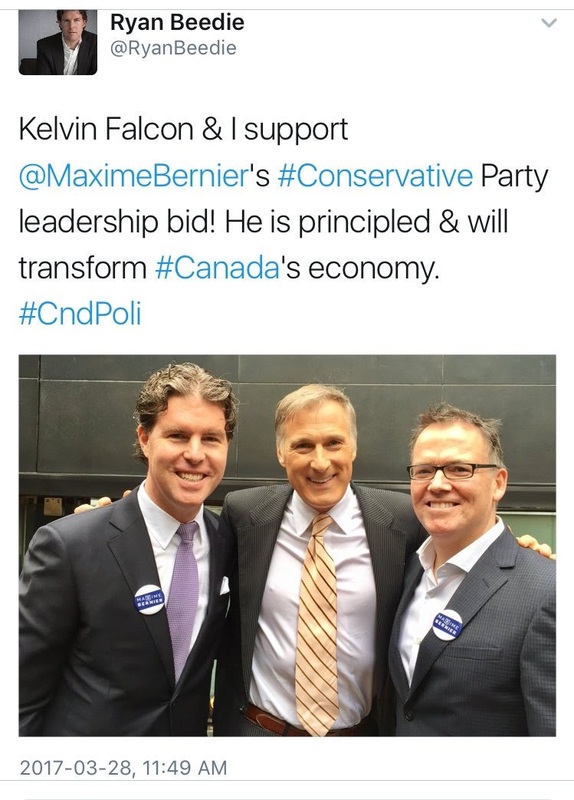 Because the problem with imposing all sorts of caps and limitations on how a party is to raise funds from its own members/supporters is eventually you end up at a place where public subsidies may be on the table. To be crystal clear, I'm opposed to union and corporate donations to political parties. As in: zero dollars. None. 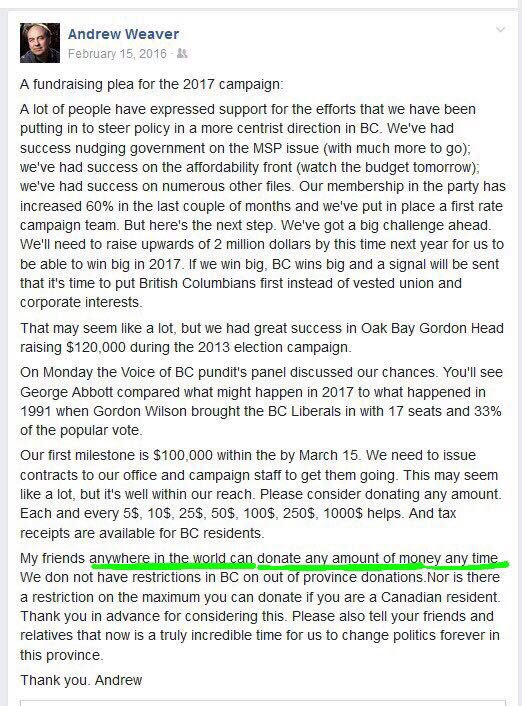 I'm also in favour of hard caps to what a person may donate; and that the donor should only be an eligible voter in BC. No foreign cash, no outside BC cash. I would want this imposed on local government candidates/parties too. Going further, I'd extend these limits to third parties; and for the first time ever, obligate them to reveal their donor lists as parties are required to do. 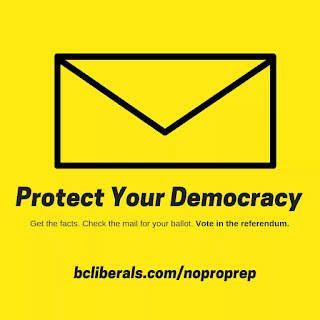 If you're operating a third party whose objective is to influence BC voters, your group should have to face the same transparency and regulations an electoral party faces. However, we're talking about a party sponsored fundraising dinner. I suppose the flak comes from those who hate political parties of any stripe and I get the sentiment, but let a party bring its own supporters or members to an event to raise cash internally; subject to fair and reasonable limits and transparency of course. 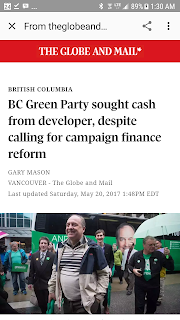 I'll bet that in a short time from now, when BC politics sits under a new set of political fundraising rules, we'll look back on this as a silly tempest in a teapot. We have many more issues to deal with. It's going to take hard work to undo 16 years of neglect and abuse by the former govt. (edit 11:35am) Lets stop pretending any party has any moral high ground here.